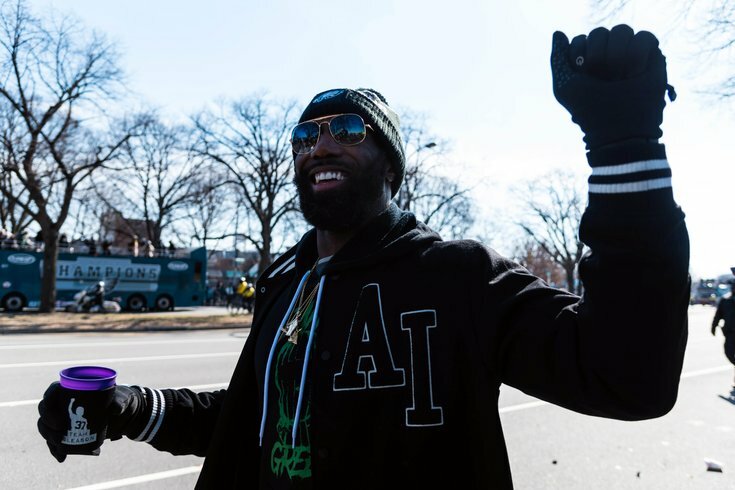 Eagles strong safety Malcolm Jenkins meets with fans during the Eagles Super Bowl Parade. The sea of dark green that spanned as far as the eye could see began the chant of "MVP, MVP, MVP," which throttled the Philadelphia Art Museum columns and surrounding buildings at their core when Carson Wentz was introduced – and deservedly so – on Thursday from the millions gathered on the Parkway for the Eagles' Super Bowl celebration. Though arguably the MVP of these indelible 2017 Super Bowl champion Eagles began his grand vision and impacting voice four years ago. That's when the Eagles signed Malcolm Jenkins. It's not surprising that the 2017 Eagles developed their captain's wrought-iron personality, then developed into the team he always envisioned. Four years ago, when Jenkins arrived, he trumpeted the central values of "team," "family," and "oneness." That didn't happen in Jenkins' first year, under Chip Kelly. It started to evolve in his second year, took a big turn in his third year, especially under Doug Pederson, and came to fruition this year. There is a reason why Jenkins was at the eye of each swirling hurricane of players before Eagles' games, stirring determination. It's why Pederson deferred to him, why Wentz and Nick Foles sought his wisdom and why defensive coordinator Jim Schwartz had the faith and trust in him to call the defense and play five different positions this year: linebacker, nickel, strong and free safety and cornerback. Jenkins had the hit of Super Bowl LII when he leveled New England Patriots' wide receiver Brandin Cooks circling back in the second quarter. He practically eliminated Pats' running back James White from doing anything. Jenkins, who had four tackles in the Eagles' breakneck-paced 41-33 victory, limited White to two catches for 21 yards, after being targeted six times. In Super Bowl LI last year, White was targeted 16 times and caught 14 passes for 110 yards – both game highs – and a touchdown. It's why Jenkins, the nine-year NFL veteran, was the heartbeat of this Eagles team – and possibly its MVP. "This team is the MVP, I mean everyone on this team contributed," Jenkins countered. "When I first got here, I could see the potential of this team. I saw the pieces at work. You saw in the guys who were already here. Each year I saw an amount of growth, and that's a testament to not only me but to Jason Peters, Brent Celek, Jason Kelce, Zach Ertz, Nick Foles, guys who were here from the start. "It started with Doug, too. Doug played in the NFL. He knows the NFL player's mentality. I think the biggest difference with Doug is that he let us have input; he made it about all of us, the players, the coaching staff, and the support staff. It's something Chip [Kelly] never got. You didn't see that with Chip. He had a college attitude. "It's been a fun journey. We were a super confident group that had a lot of success. Most of the guys you talk to and ask where this journey started, they will tell you years ago." The turnaround to this season, Jenkins stressed, came after the Kansas City Chiefs game. It was a game the Eagles lost, after committing two turnovers and six sacks for minus-34 yards. "We let them off the hook – and we knew it," Jenkins said. "We played in a hostile environment and we felt like we let that game slip. That first taste of adversity, guys bounced back. We found out we can play with anybody. The next game, Jake [Elliott] kicks the 61-yarder and we took off. "After that, our confidence grew and it was this attitude that we would find a way to win, it didn't matter. For me, that was the turning point, because a lot of the younger guys looked towards the veterans and saw that was a loss, but no one changed their minds about where we were and who we were. We went right back to work and I think that instilled a little belief in them as well." Foles' game against the Giants took the "no-matter-what-it-takes" mantra to a whole new level. The Eagles gave up 27 first downs and 504 yards of total offense in a 34-29 victory in which Foles threw for 237 yards and four touchdowns. In the six games Foles started, he completed 124 of 193 passes for 1,410 and a 64.2 completion percentage. Foles also threw 11 touchdown passes against three interceptions. Against Oakland, Foles struggled, but the defense caused five Raider turnovers to clinch the No. 1 seed in the NFC. Jenkins never panicked, even in the Super Bowl after the Patriots drove for a third-straight 75-yard drive in the second half. It was Jenkins who was imploring everyone, "We have this. We're going to be fine." He's 30 going on 60. He's always been an old soul, though still carries some resentment from the way he was treated by the New Orleans Saints, who drafted him in the first round with the 14th overall pick in 2009. In 2014, the Saints signed high-end free agent safety Jairus Byrd from Buffalo and let Jenkins go. Byrd played in the Saints' first four games in 2014, then suffered a torn lateral meniscus knee ligament during practice on October 2, 2014, and hasn't been the same since. "That bothered me only because [the Saints] didn't say anything to me," said Jenkins, who in Feb. 2016 signed a four-year extension with the Eagles worth $35 million with $21 million in guarantees. The deal was worth $40.5 million and it will keep him under contract through the 2020 season. "The season ended, they didn't give me an offer; they didn't even call me. That's what bothered me the most, just the courtesy of telling me they were moving on. I would have been fine with that." Jenkins, who just picked up his second Super Bowl ring – he won one with the Saints in 2009, his rookie year – led the Eagles in tackles his first two years and was second on the team in tackles this season behind linebacker Nigel Bradham. "This was by far the most enjoyable year I ever had playing football," Jenkins said. "I've been playing ball for a long while, been to a bunch of championships, and had a lot of success. This is by far the most fun I've had. It's the most challenged I've been, but at the same time the most satisfying and gratifying season I've even been a part of. "This is the best team in sports. I mean the best T-E-A-M in sports, from top to bottom. We are a T-E-A-M. We don't hinge on one guy to be a success. Every game, it wasn't about who has a game, or who gets the credit. It was about getting it done. Everyone on this team contributed. We have the players and obviously the talent to do this again. We can compete with anybody in the league. Now, when you're talking Super Bowl, I think we can when we process everything the way we did this year, and not look at the mountaintop until it's time. "We have to get back to embracing the valley and the grind. We should be a contending team. We're not going into the off-season looking at gaping holes. What we did this year gets us nothing next year. But right now, I'm going to enjoy the parade." A parade that probably wouldn't have been possible without No. 27.